How should we view the evolution of a sports figure? I guess this depends on what types of changes take place. Commonly an athlete will play for a few years and hit his or her prime. The star will exist as such for 5 to 7 years, and then begin to decline. Oftentimes athletes hang on for too long, lingering in the league long past any sensible expiration date. I’d like to discuss one athlete whose career arc defies this prototype: Tim Thomas. Thomas is the Goalie for the Boston Bruins. Last season he set an all-time record for save percentage, led his team to the Stanley Cup, and was honored with the Conn Smythe Trophy as Most Valuable Player of the National Hockey League Playoffs. Yet, just a few years ago, hardly anyone knew him. Thomas was born to a working class family in Flint, Michigan. His parents made every sacrifice necessary to give young Timmy a chance to make it big. He idolized Jim Craig, goalie for the underdog 1980 USA Olympic team that famously toppled the Soviet Union in one of the greatest David-and-Goliath tales in all of sports lore. Thomas himself faced an uphill climb as an American trying to make the NHL. He played four years of hockey at the University of Vermont and was drafted 217th overall by the Quebec Nordiques in 1994. From 1997 through 2005, Thomas toiled away in obscurity. His unorthodox style scared away many teams. He bounced around the minor leagues of North America, Sweden, and Finland. Though he thrived at nearly every location, scouts still couldn’t seem to come to grips with his unconventional style. Most respectable goaltenders of the time practiced the butterfly style, as popularized by the great Patrick Roy. If they differed, goalies tended to be more upright, like Devils stalwart Martin Brodeur. Tim Thomas exists somewhere miles away on the Hockey Goalie spectrum. He’s more likely to flop, kick, or twist than emulate any common textbook techniques. But Thomas’ drive and determination eventually led to a spot on the Boston Bruins roster. He suffered through stints in the minor leagues and ill-fated backup roles to lesser goaltenders. He toiled on poor teams struggling to make the playoffs. Finally, during the 2007-2008 season, he seized the starting position for good. His unique style and acrobatic displays led to an All-Star Game birth that year as well. Miraculously, at the age of 33, Timmy Thomas had finally grown into the player he’d always wanted to be. Thomas’ narrative recalls that of another hero. This man belongs to the comic world and evokes all of the fearless and nimble attributes of the aforementioned stopper. I’m of course speaking of the legendary Daredevil. Matt Murdoch began as a boxer and gymnast in New York City. A fateful accident led to blindness, but also instilled a burning passion in the man who was to become Daredevil. He spent evenings avenging his father’s death. With great ease he bounced from building to building and displayed a fearless attitude in the face of grave danger and unrelenting attacks. 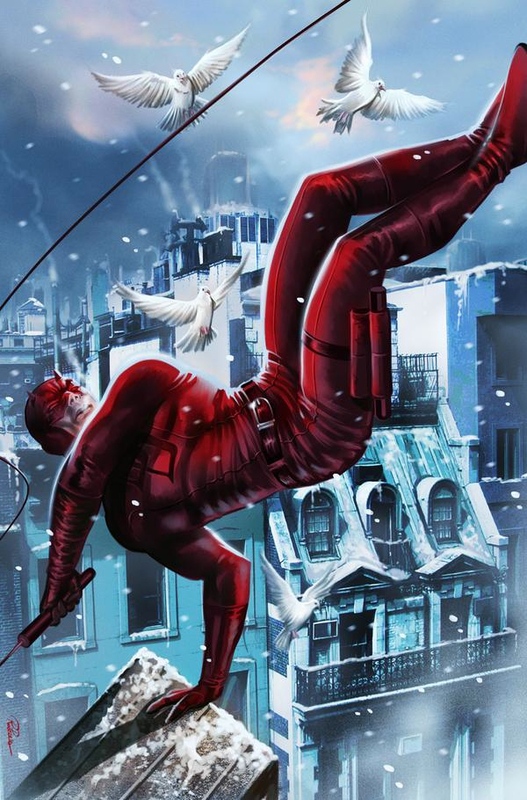 Daredevil was never blessed with the more gaudy super powers of some of his more lauded counterparts. He had to rely on his agility, training, and instincts to overcome his foes. I think the comparisons between the two heroes are obvious. Against all odds, and with uncommon athleticism and agility, both Tim Thomas and Daredevil rose to prominence. But, Thomas certainly was not always this way. I think here we can return to our opening quandary and examine his wholesale changes. How is it that Tim Thomas can exist for so long, yet take on such different attributes over time? Contemporary American Philosopher David Kellogg Lewis introduced the world to the ideas of Endurantism and Perdurantism. An endurantist would suggest persistence of identity. That is to say all parts of that person have always existed. A perdurantist would suggest that the subject (in this case Thomas) exists in the form of spatial parts and temporal parts. Thomas has always been the same man; his bodily form and outward appearance have been consistent. These spatial parts have remained fixed. However, over time, parts of this goalie have transformed into something greater. In the years prior to Tim’s emergence, he existed only as a struggling goaltender bouncing from continent to continent just trying to make his mark. 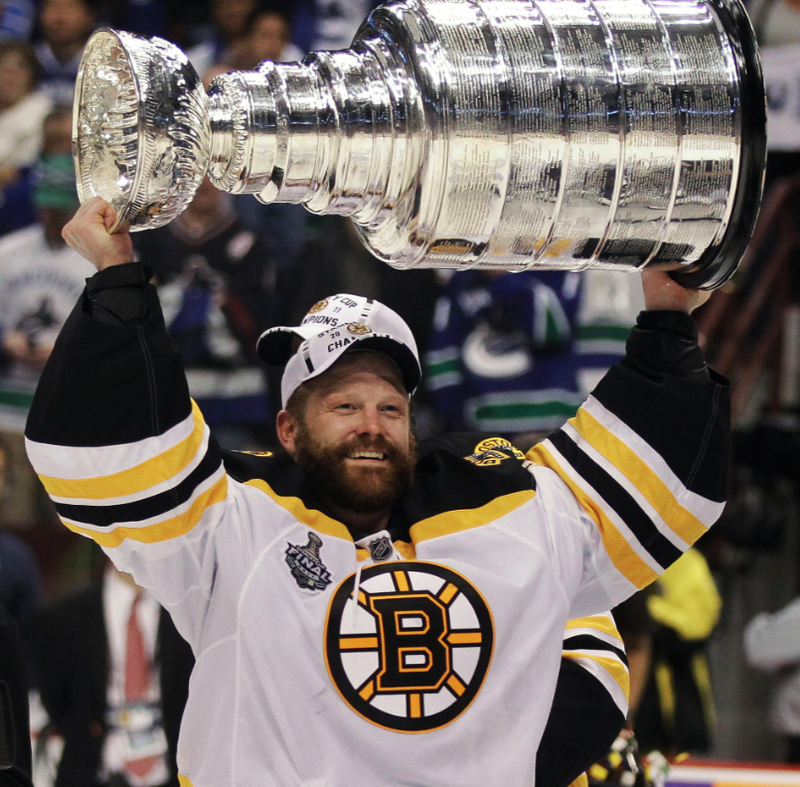 In current times, Tim Thomas exists as one of the most feared keepers in all of sports. So how should we view this enigmatic keeper? I would tend to say the essential makeup, drive, and determination have always existed inside Thomas. But we can only judge someone truly on his actions and accomplishments. In that sense, I would take a perdurantist stance on Thomas. It is against all odds or trends that this man has transformed into a game changer. His current temporal existence exceeds that of any normal athlete. man was a rock in net. Team after team seemingly had more offensive weapons and a more dangerous attack than that of Thomas’ mates. Yet time after time he came up with big save after big save. 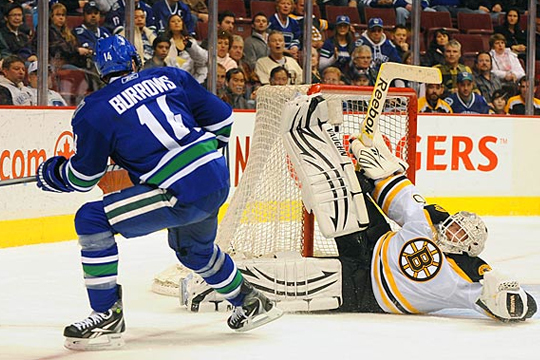 The Bruins persisted through three seven game series and emerged as victors. Tonight, Thomas and the Bruins embark on another Stanley Cup Playoff run. They face an uphill battle to repeat. But like Matt Murdoch transforming into Daredevil, Thomas has taken on new parts to his persona. The acrobatic feats and audacious saves this man is capable of are truly awe-inspiring. No position in team sports is more vital than a goalie in hockey. A hot goalie is capable of bringing his team to the Promised Land. 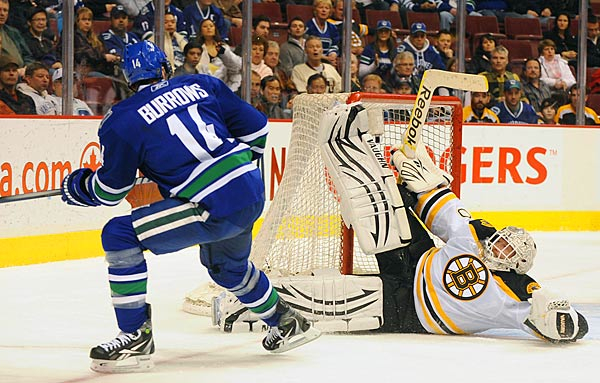 I’ve seldom had moments as anxious and riveting as those last spring when Thomas made a big save and rescued the Bruins from the jaws of defeat. 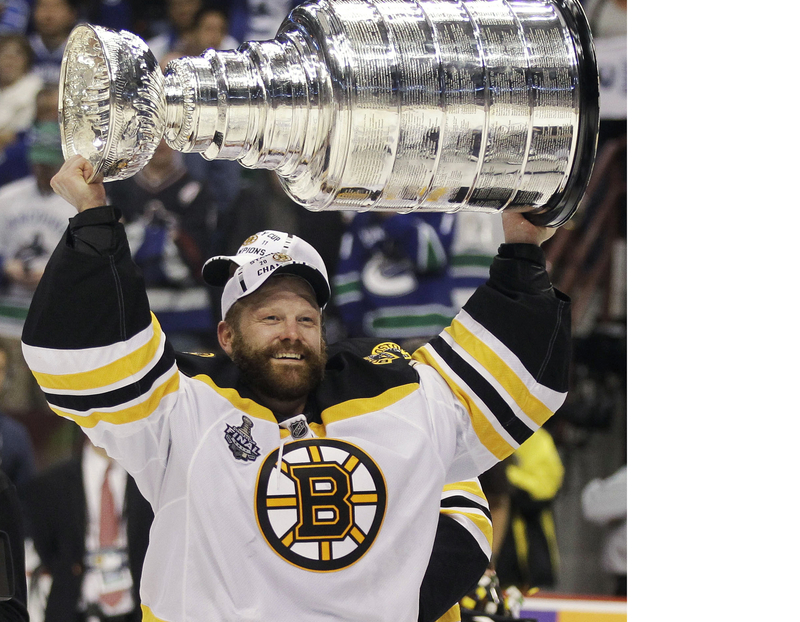 Chances are the Bruins won’t raise another Stanley Cup this spring. Common sense indicates no man is capable of such dominance two years in a row. But Tim Thomas has never been one to conform to expectations.